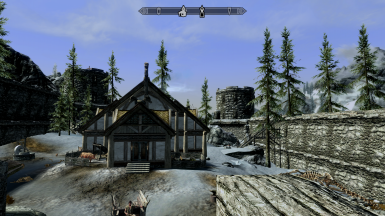 Walkable Walls, Uniformed Guards & Guest Quarters at all Hearthfire Houses. 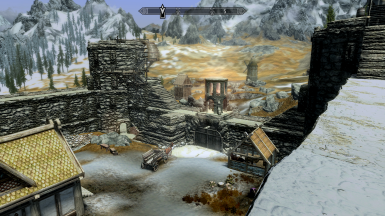 It turns out that the land the Jarl's steward sold you in each of the Hearthfire Holds have old stone walls surrounding the building sites. 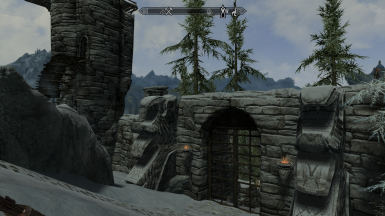 These walls and the towers they support are now yours to use as shelter as you build your fancy new Hearthfire house and to use as a small fortress/village after the house is completed. 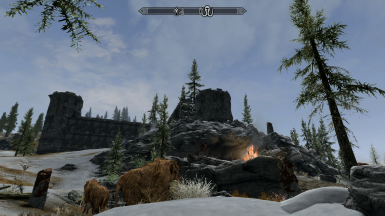 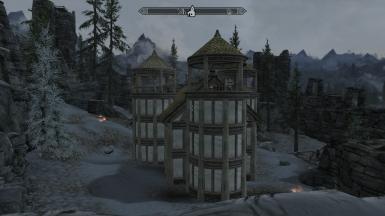 To start this mod simply purchase each of the 3 Hearthfire properties as you normally would, travel to the build sites and use the build stations to build your house and refit the old fortifications. 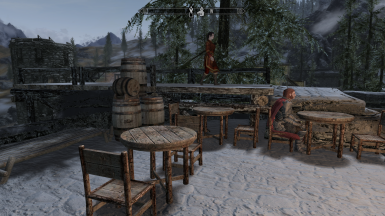 A second workbench is added to your Hearthfire build stations allowing you to refit the old battlements and towers with new works of wood and stone using Hearthfire's sawn logs, nails, iron fittings and quarried stone blocks. 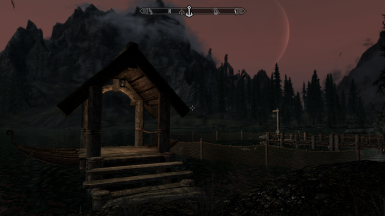 All exterior build-stations including the HF build-stations and log pile can be toggled on or off using the Configuration Candle located in the barracks or Lakeview guardhouse. 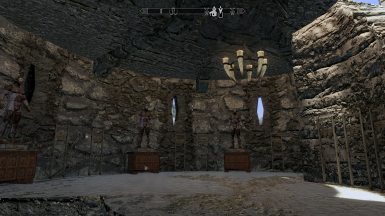 After you have opened the Barracks and the Armory you can hire up to 8 veteran men-at arms to actively guard your property in both day and night patrols. 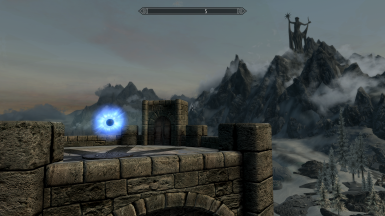 (6 at Lakeview) Add 2 hard hitting destruction magic wizards to your patrols by opening the portals at the top of the Enchanter's Tower. 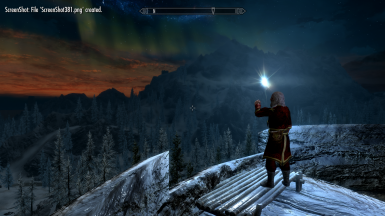 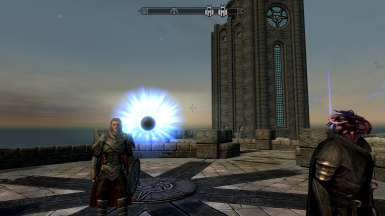 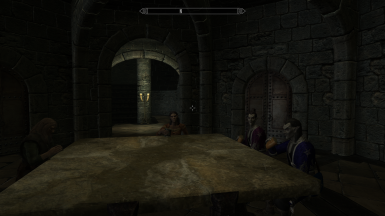 The mage-guards live in Service Hall below the College of Winterhold. 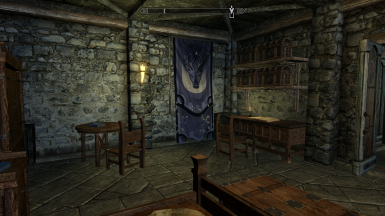 All Guards patrol for 12 hours per day,practice archery/spells/sword-play on targets/dummies, visit the tavern to relax, eat in the barracks or Lakeview guesthouse and sleep in the barracks or Lakeview guardhouse. 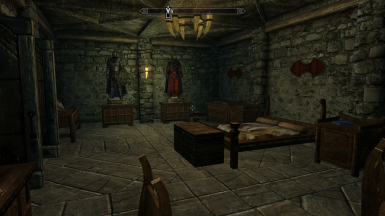 (mage-guards sleep in Winterhold) All guards wear the local player-configured man-at-arms or keep-wizard uniform and are able to be used as regular followers. 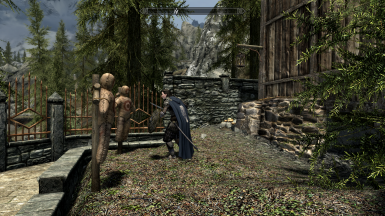 All guards level with the player up to 150. 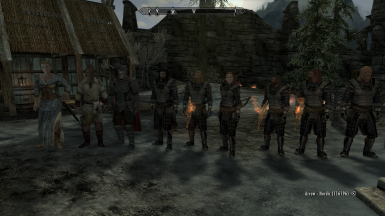 Each mannequin creates and distributes player-designed guard uniforms that are worn by all local guards. 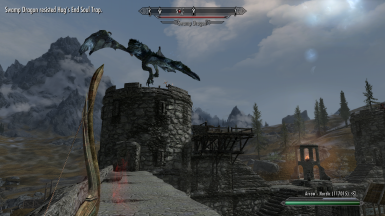 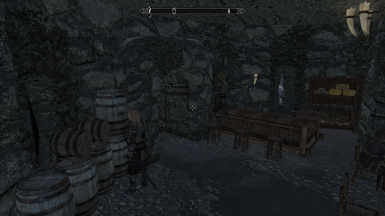 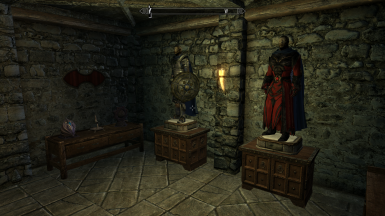 Each house has one fighter-guard mannequin and one mage-guard mannequin located in the Armory and Enchanter's Tower respectively. 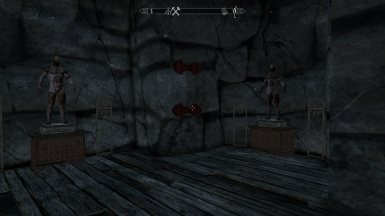 Labeled base cabinets designate which mannequins are the uniform mannequins. 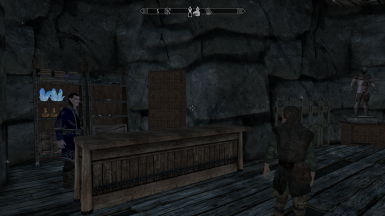 Put weapons and other non-armor gear in the cabinet to add them to the local uniform. 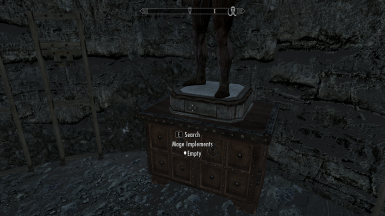 Anything put on a uniform mannequin and/or in it's lower misc-gear cabinet will be distributed and equipped to the corresponding guard group. 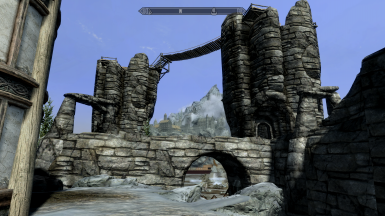 Large stone defense walls and some wooden scaffolding allow “castle defense” type game play. 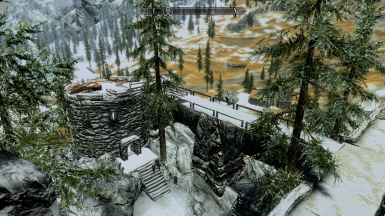 When you trigger an attack you will find yourself running up and down stairs from wall to wall defending your keep with your highly trained guards fighting along side you. 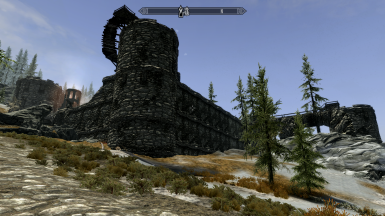 These sturdy walls turn your Hearthfire house into a fully functioning battle ready fortress. 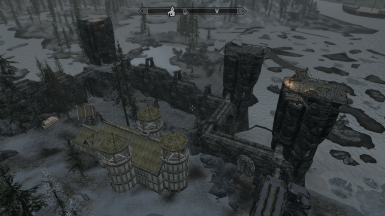 All stone walls and fortifications have been configured to “never fade” so the walls and towers can be seen from all distances without the need for custom LOD files. 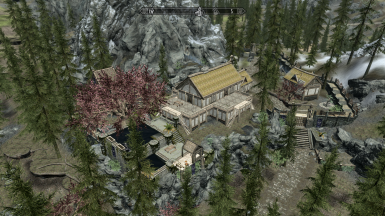 5 fully outdoor “no load door”towers house an armory, a magic shop, a 3-floor tavern and a large 2-building barracks with a kitchen/eating area. 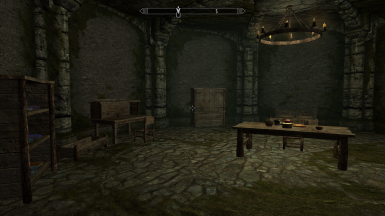 The armory and magic shops contain all relevant workstations and displays including the Staff Enchanter and the Spider Crafting Machine. 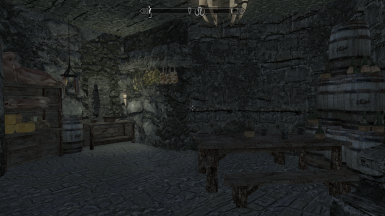 When dragon attacks and/or bandit raids are turned on in the configuration candle menu and the player opens any door in the walls there is a small chance to trigger an attack on the fort. 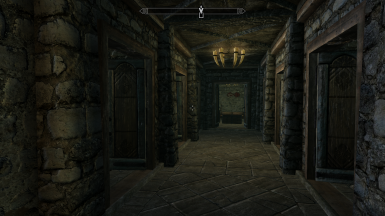 Successful trigger events can stack or accumulate with each opening of a door if triggered before the prior attacks can spawn and play out. 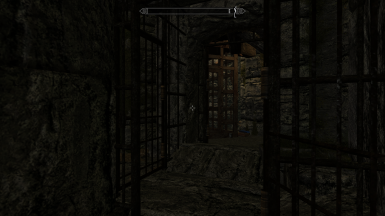 By repeatedly opening and closing a door you can produce large “castle defense” battles to defend your walls. 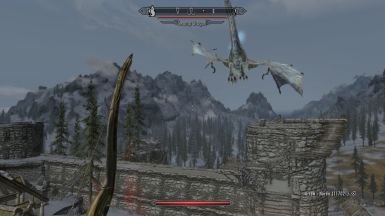 Each trigger event has a random chance to spawn 1 dragon and/or up to 4 groups of 3 bandits with groups spawned at different locations outside the walls. 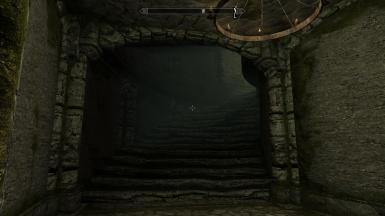 To keep it challenging all enemy NPCs are leveled. 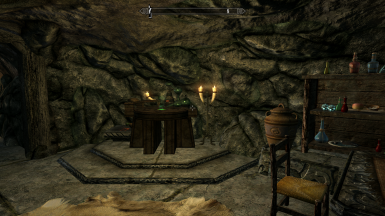 The Configuration Candle in the player's quarters allows dragon and bandit attacks to be toggled off or on individually. 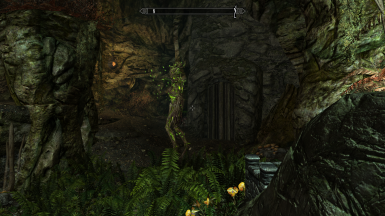 For truly epic auto-regenerating battles attack triggers can be set to be activated by NPCs opening doors too. 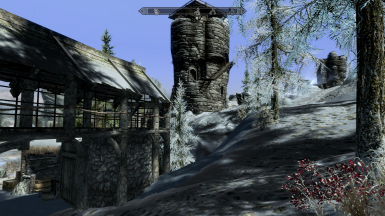 (hour long raids can happen) Attacks and Raids cannot be turned on at Lakeview because such a relaxing location is antithetical to large battle scenes or true castle defense game-play. 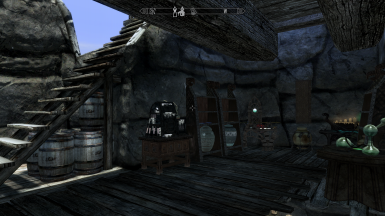 This small player's room in the barracks includes a bed, weapon racks, safe storage, the local Banner Selection Rope, the local Business Management Ledger, the local Business Earnings Safe and the local Configuration Candle. 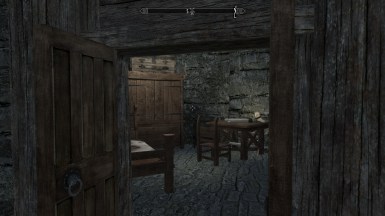 The room can be designated as the living quarters for the local Housecarl moving your Housecarl's sleeping area out of the house and into the barracks with the other men-at-arms to serve as their commander. 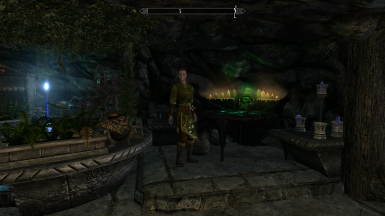 Access this setting by using the Configuration Candle. 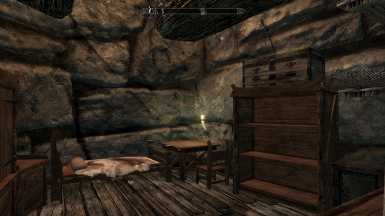 The barracks or Lakeview guesthouse contain assignable guest beds for followers and assigned beds/living quarters for all added local NPCs. 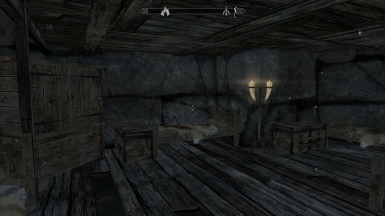 There are up to 10 guest beds available per house site. 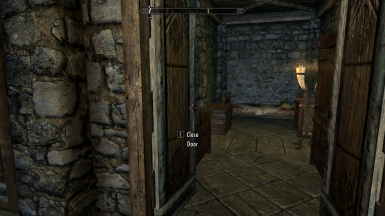 Any NPC can be checked into the local guest management system and assigned a sleeping area by using the Guest Ledger located near the unused beds in the Barracks or Guardhouse. 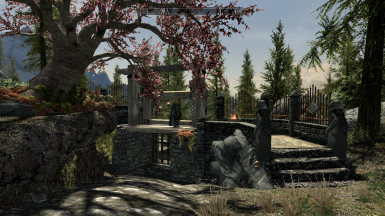 The new guest must be currently following you in your 1st follower slot and it is best to only have one follower when checking in. 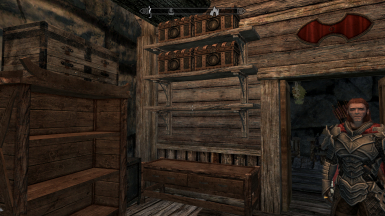 Each armory contains a forge, an armorer's workbench, a sharpening wheel and many armor display mannequins. 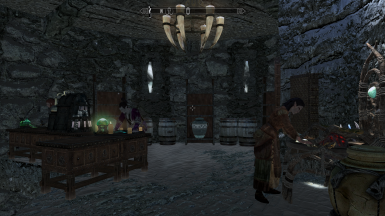 A blacksmith is hired when you furnish the armory tower. 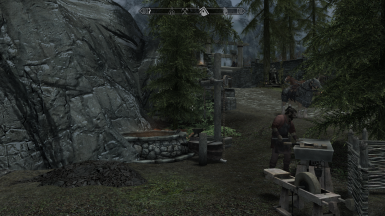 The Blacksmith works the forge, visits the tavern, and sleeps in the barracks or the Lakeview guest house. 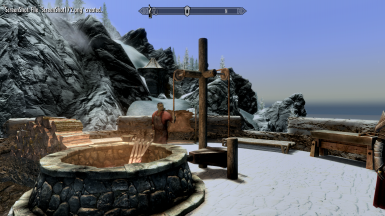 At Lakeview there is no armory so the Blacksmith is hired individually and spends his time at the outdoor forge or foraging for ore in the local caves. 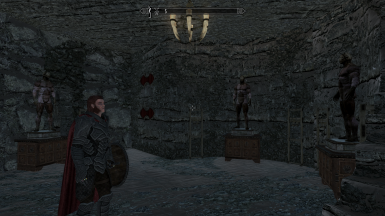 The Auto-Outfitting Uniform Mannequin for the fighter-guards is located in the armory or the Lakeview guardhouse. 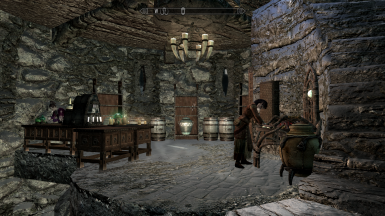 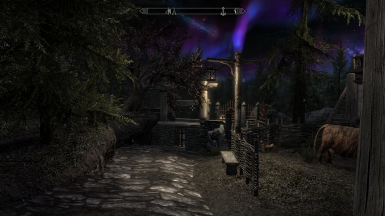 Opening the portal to Winterhold furnishes the Enchanter's Tower with the standard magic shop furnishings and hires the enchanter and apothecary. 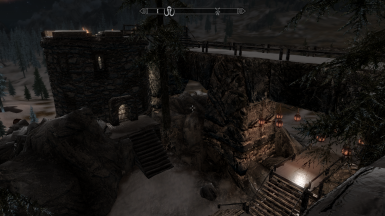 The enchanter and apothecary sleep in an underground tower below the College of Winterhold and travel through the portal to/from work everyday. 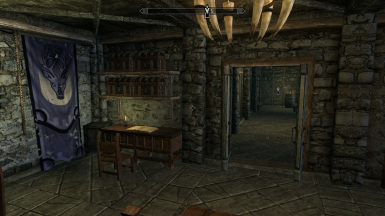 The Winterhold Hall of Service has two open rooms with unassigned beds for followers who can use them. 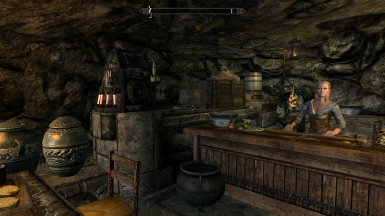 When enabled the magic shops include standard alchemy and enchanting workstations. 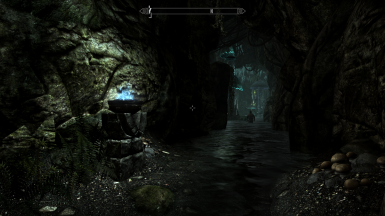 The Staff Enchanter and the Spider Imbuing Chamber from Solsheim are enabled when they are discovered (or revisited) at their original location. 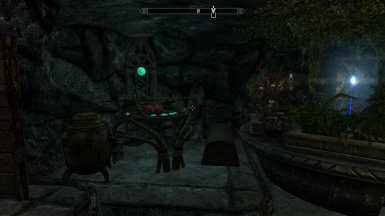 Containers with blank staffs, heartstones, spider parts and recipes are also installed with these crafting stations. 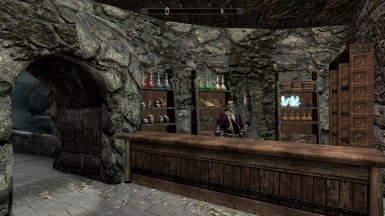 The Auto-Outfitting Uniform Mannequin for the mage-guards is located in the magic shop or the Lakeview guardhouse. 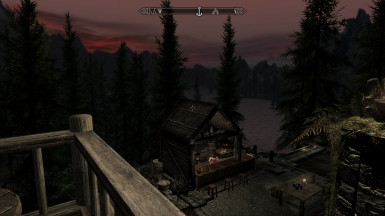 A tavern-keeper is hired when you furnish the tavern tower or the Lakeview pool deck. 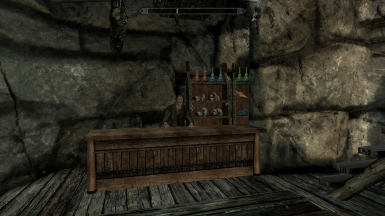 A merchant and bard can be hired/fired individually after the tavern-keeper has been hired. 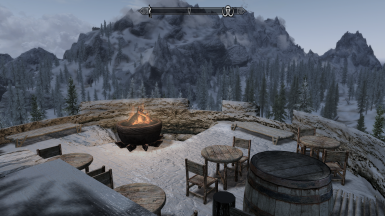 (Blacksmith and Groundskeeper at Lakeview) Each tavern has plenty of food and drinks for the off-duty guards, workers and visiting guests to eat and drink. 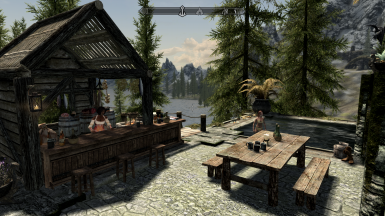 The tavern at Lakeview Manor has a pool deck with a shallow sitting pool and deeper swimming pool. 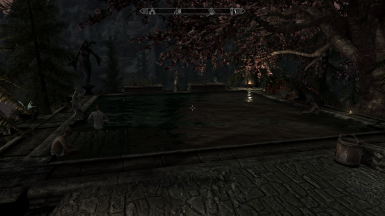 All NPCs entering the pool water areas will remove their clothing to bathe and redress when they leave the area. 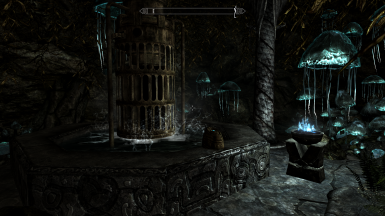 The hot water mist and statue water spout features are controlled with the pull chain mounted on the pillar by the stairs. 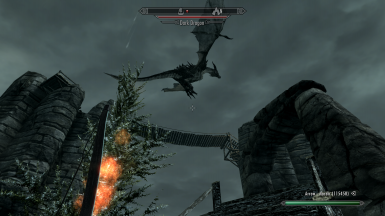 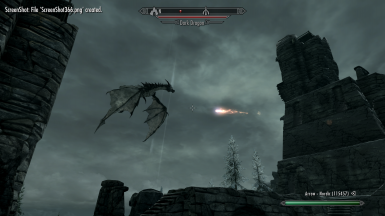 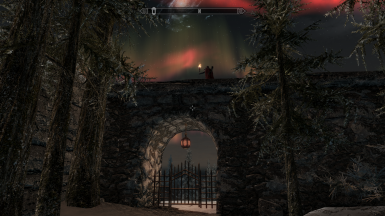 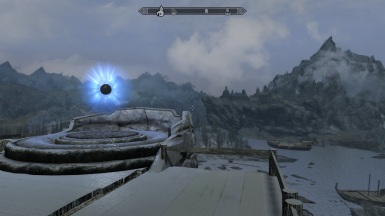 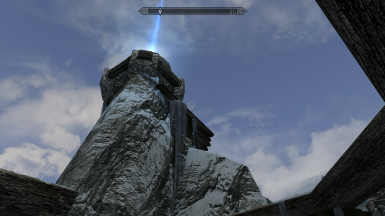 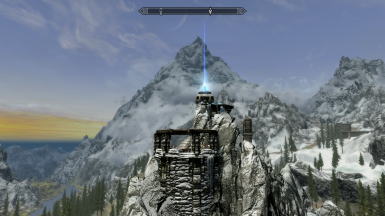 Each Hearthfire house is equipped with a magic portal on top of the Enchanter's Tower allowing instantaneous travel between your property and Winterhold. 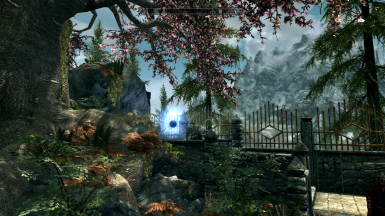 The Lakeview portal is located on the wall by the guard tower. 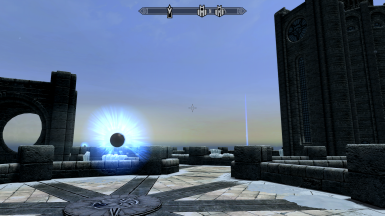 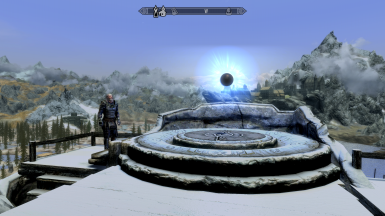 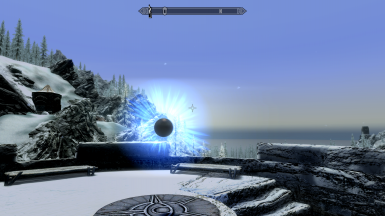 The portals must be opened using the prepared void stones found sitting on top of the partition wall in the Archmage's quarters in the college to be enabled for use. 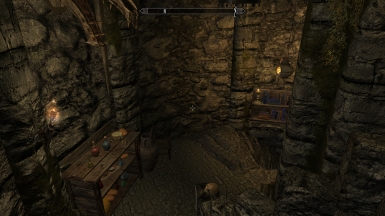 After the portals are opened the enchanter's shop and apothecary shop are installed in the Enchanter's Tower. 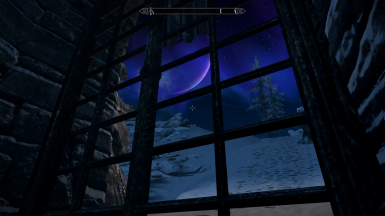 The enchanter and apothecary will now use the portal to travel between their quarters in Winterhold and their work in your tower everyday. 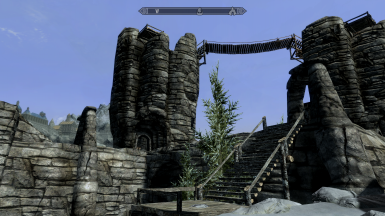 A master banner display rod with a long rope to activate it is installed in the player's room in the 1st barracks tower or Lakeview guardhouse. 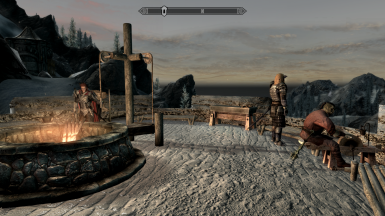 Pulling this rope allows player configuration of all locally displayed banners. 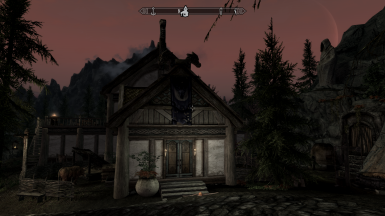 The banner displayed here is also displayed at every banner display on your local property including banners displayed in the Farm or Mine add-on mods. 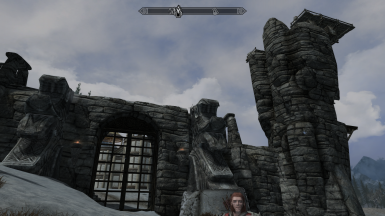 Banners update “on load”. 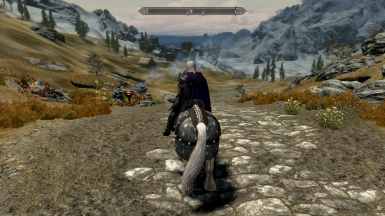 The main gates at each location automatically open only for players riding any mount. 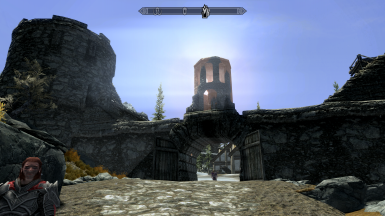 Mounted players do not trigger random dragon attacks or bandit raids when opening these gates. 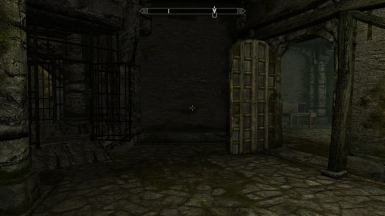 All doors automatically close 60 seconds after being opened by the player or any NPC. 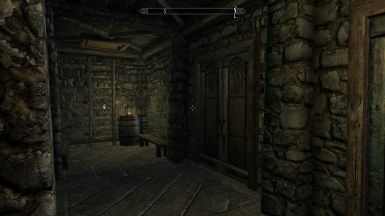 All doors and gates in the add-on mods are also converted to auto-doors with patches available on the download page. 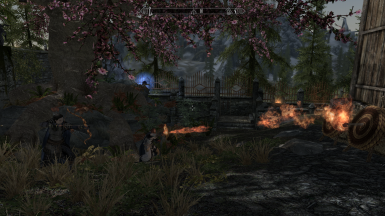 Targets and dummies give the player experience points with each successful hit with a melee or ranged weapon. 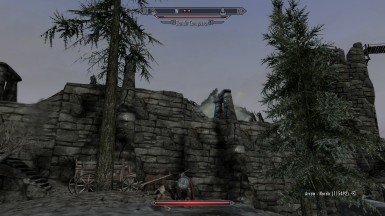 Archery targets give more XP with greater distance and they have a bull's eye that gives x2 and x10 XP bonuses when hit from near or far distances. 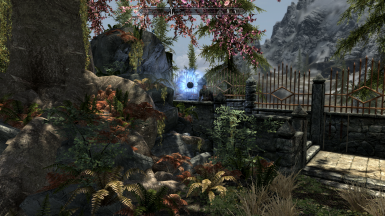 The ballistics range has 3 archery targets placed outside the wall so use the bow-zoom ability to spot the most distant target if you don't see it out there. 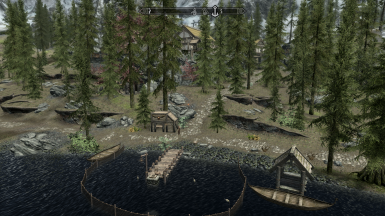 After all available employees are hired small row boats become available at Windstad Manor and Lakeview Manor for purchase through the local Business Ledger located in the barracks player's quarters. 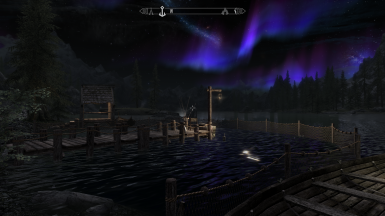 These boats enable a local fast travel ferry system between Windstad, Morthal and Solitude or Lakeview, Riverwood and Whiterun. 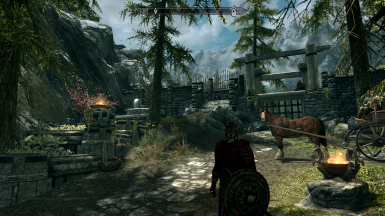 Your horse will be stored at the local Hearthfire house when using the local fast travel system. 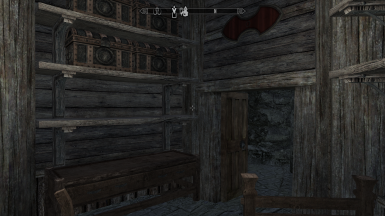 After all the towers are refitted the player's quarters contains a Business Management Ledger and Business Earnings Safe that together allow the keep to be run as a functional business. 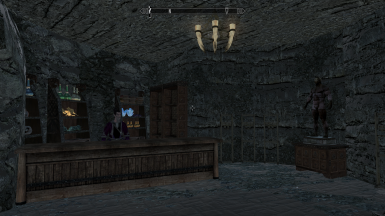 Use the ledger to furnish shop facilities in the towers, hire employees and set the local pay rate. 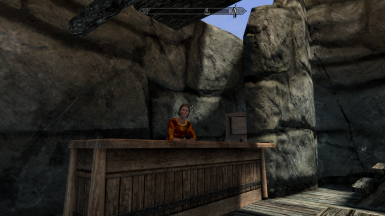 With all available employees hired a pay rate of 20 gold or less will keep the payroll paid and produce a profit in the earnings safe. 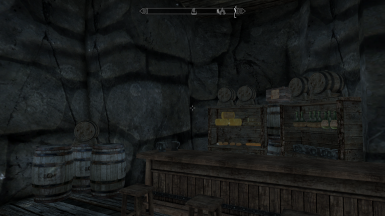 Pay rates above 20 gold will require lump sums of gold to be deposited into the earnings safe to pay the payroll and avoid a general workers strike. 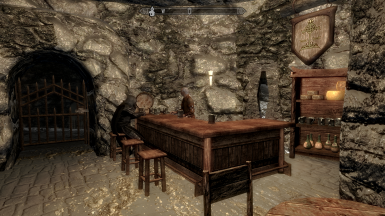 Higher pay rates turn your business into a “ gold sink” to use up some of that late game wealth. 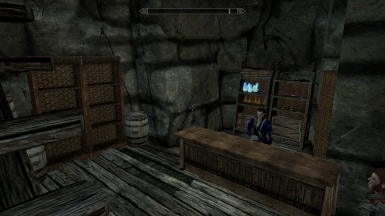 If the local cell loads with zero gold in the earnings safe all local employees will go on strike and retire to their quarters to relax. 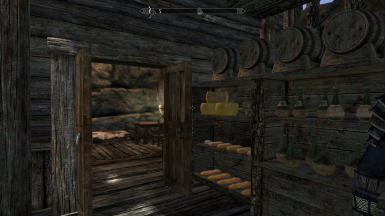 The strike will be ended on the next cell load with any amount of gold in the earnings safe. 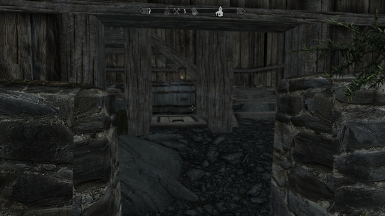 A general strike does include the businesses and employees added by the Farm and Mine add-on mods causing these workers to go on strike and securely lock their business' earnings containers until the strike is ended. 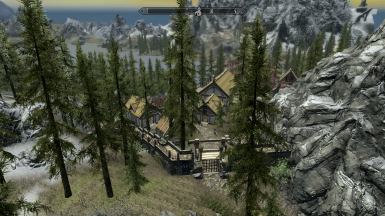 The author of this great mod has graciously granted me permission to rebuild Lakeview Extended by-hand in the new 64-bit Creation Kit. 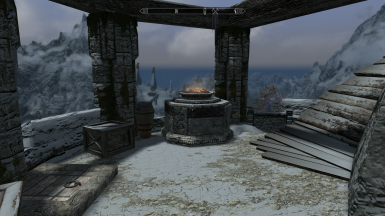 (best Hearthfire house IMO) THANK YOU Ac3s! 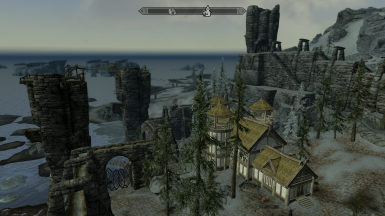 If you currently have Lakeview Extended installed you will need to uninstall it and the HGF Lakeview Extended patch before installing version 1.9 or higher of Hearthfire Guards and Fortifications. 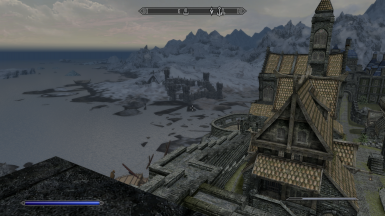 I successfully recreated 90% of Lakeview Extended adding most of its features to the Lakeview location in HGF. 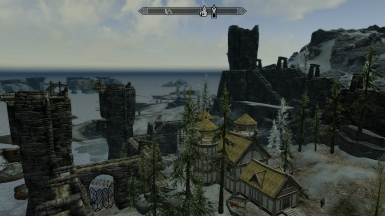 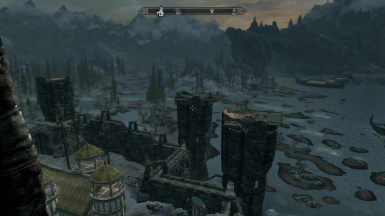 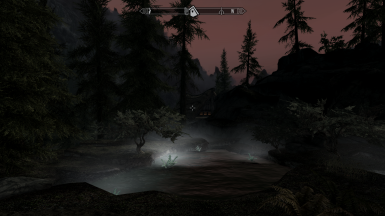 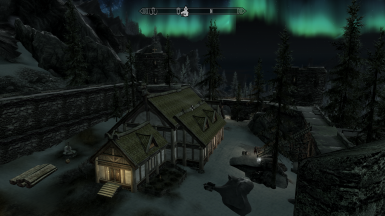 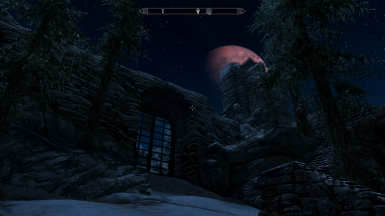 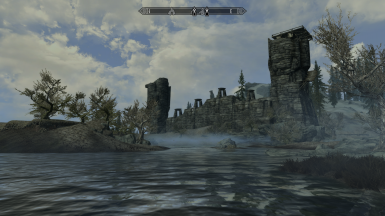 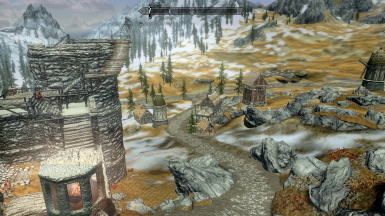 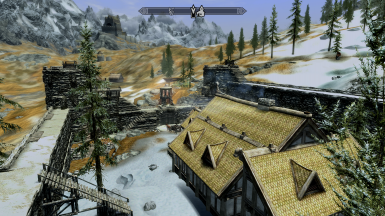 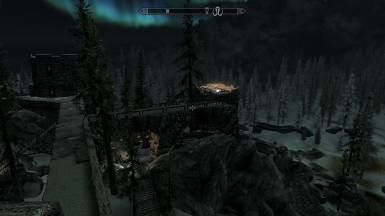 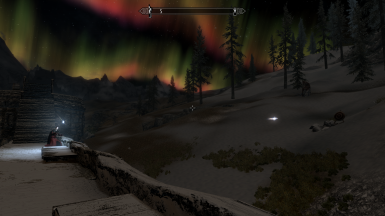 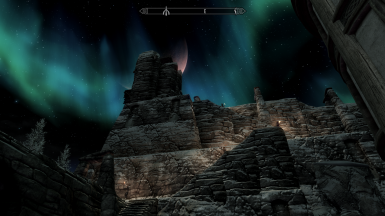 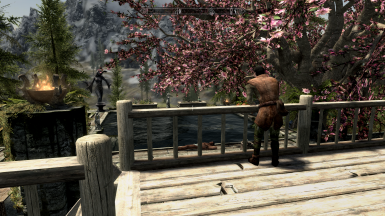 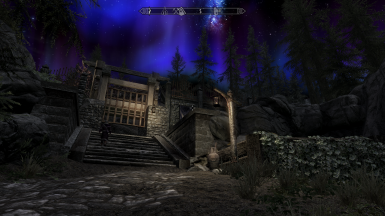 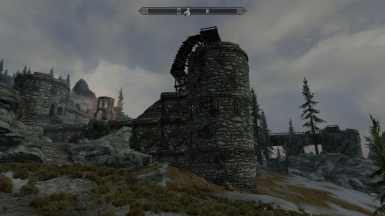 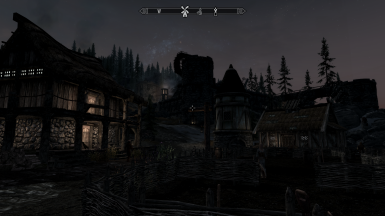 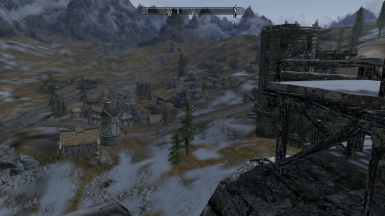 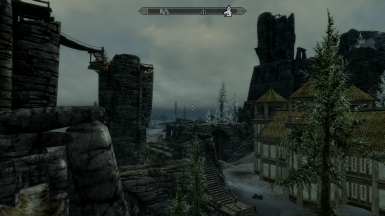 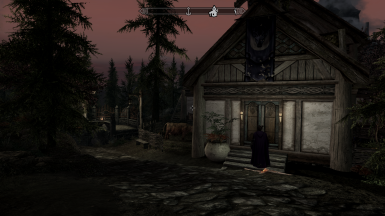 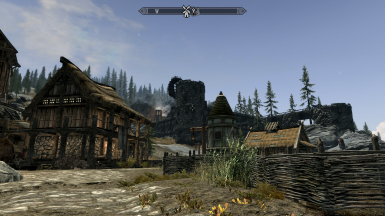 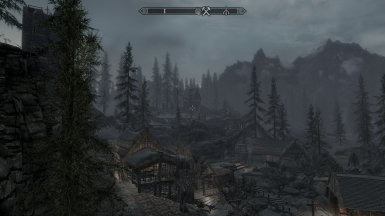 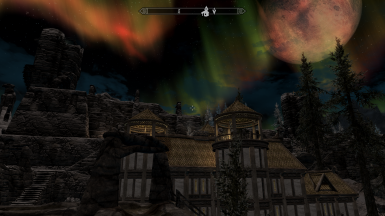 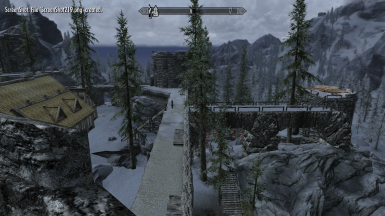 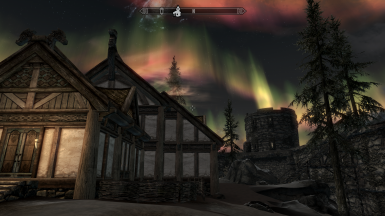 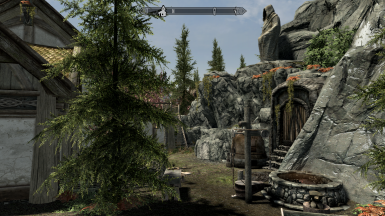 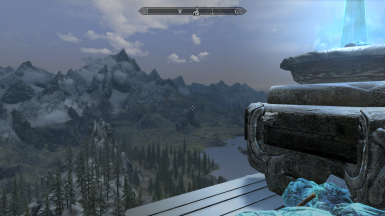 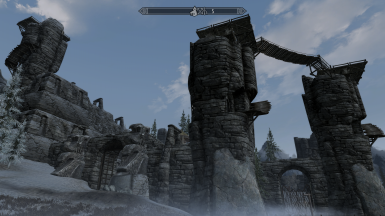 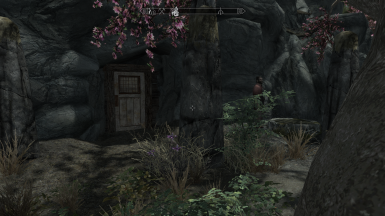 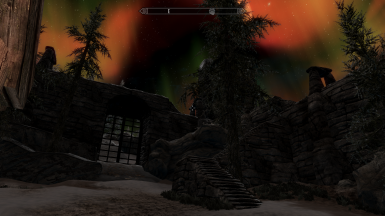 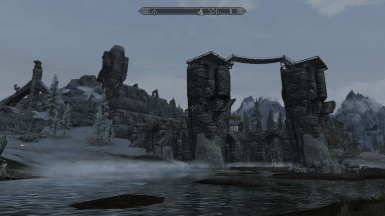 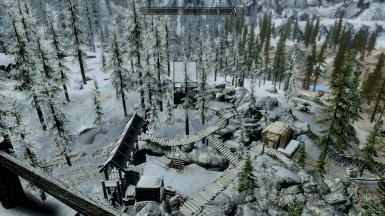 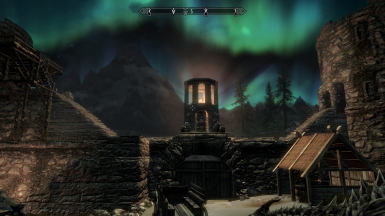 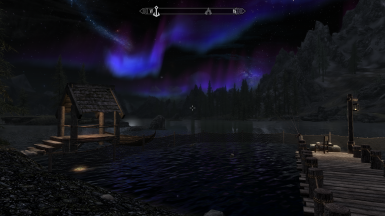 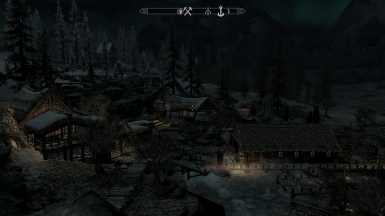 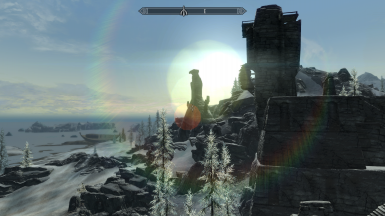 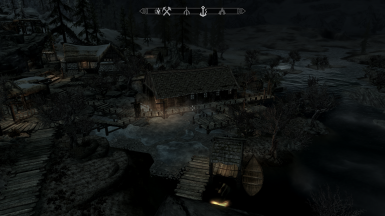 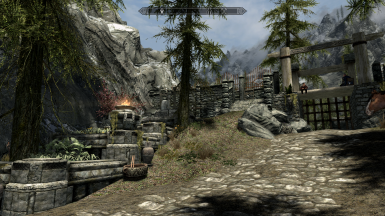 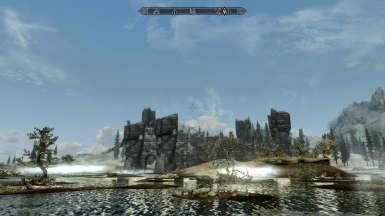 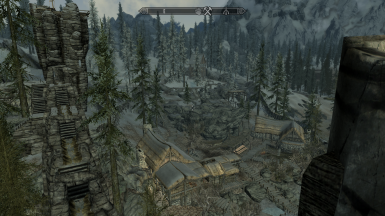 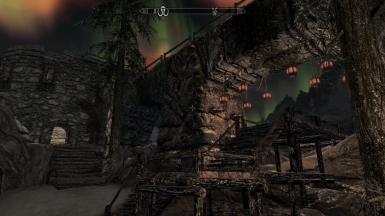 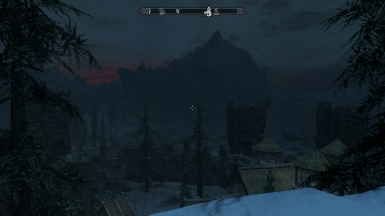 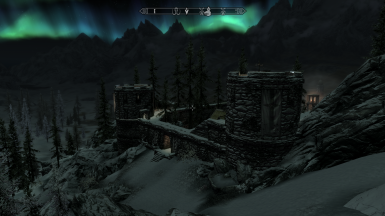 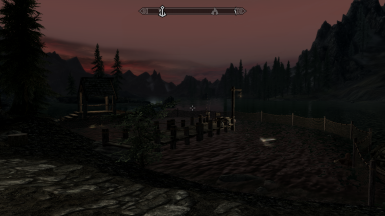 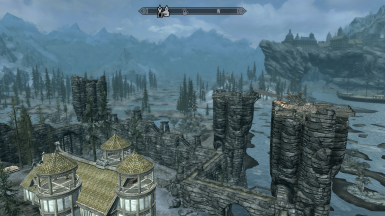 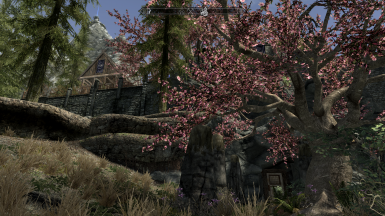 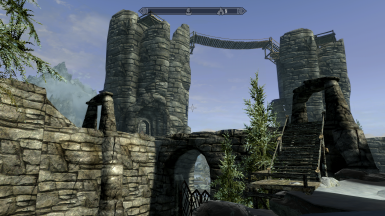 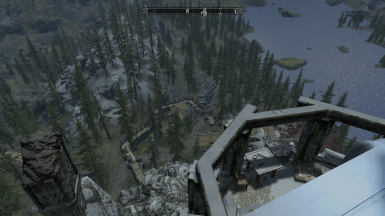 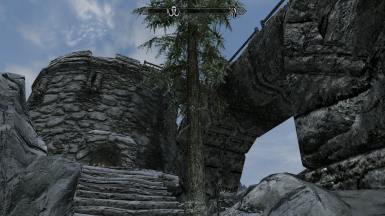 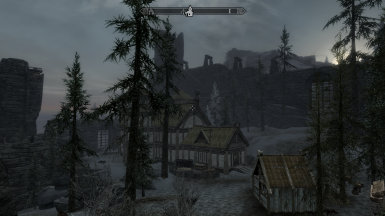 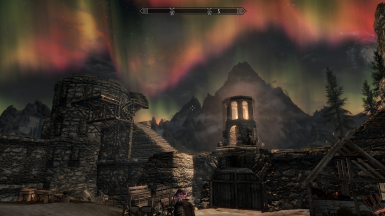 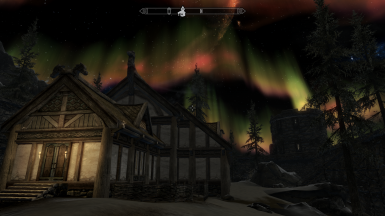 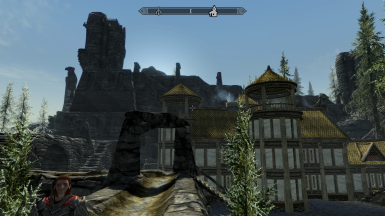 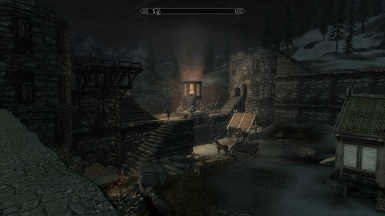 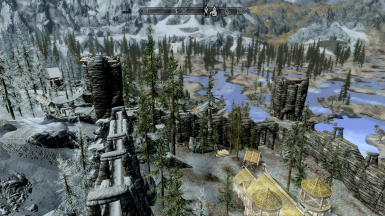 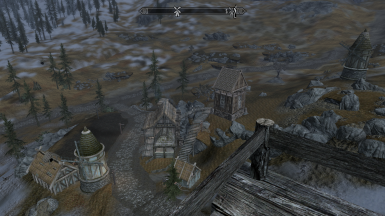 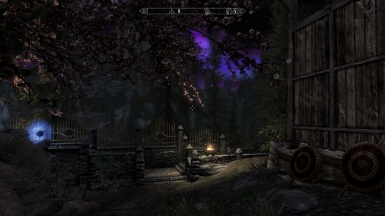 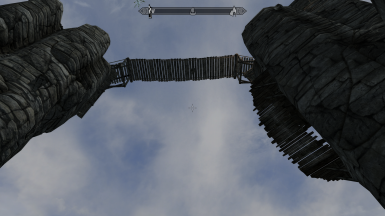 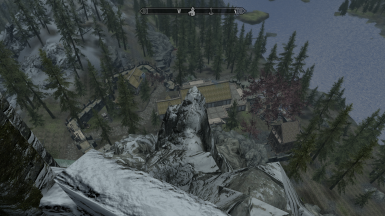 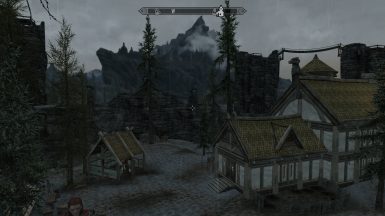 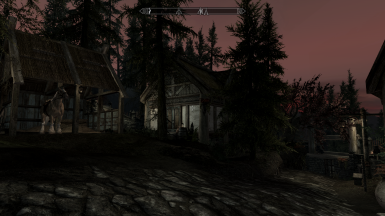 Rebuilding Lakeview Extended specifically for the 64-bit Skyrim Special Edition has dramatically increased game performance at Lakeview even with all the “bells and whistles” enabled. 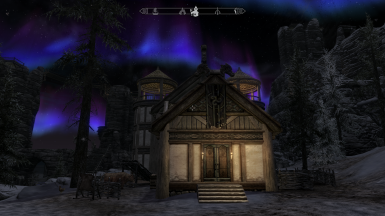 Install the performance boost patch available on download page only after all the exterior parts of all three of the original Hearthfire houses have been built. 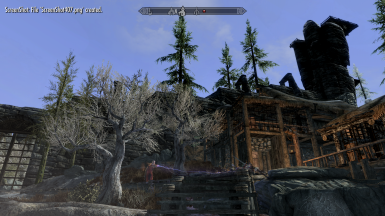 The patch installs occlusion boxes inside the local 3d building/house models raising FPS and game performance around the house sites. 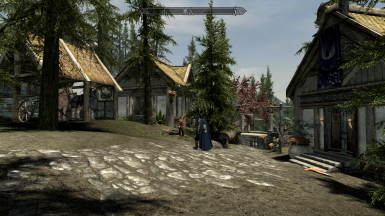 Some minor features of the original mod have been changed to accommodate the new HGF features added to the Lakeview site. 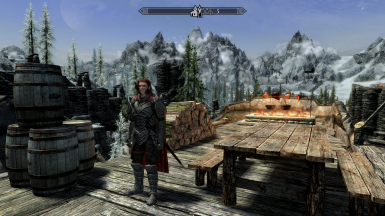 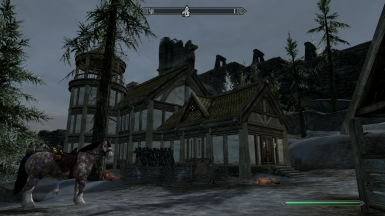 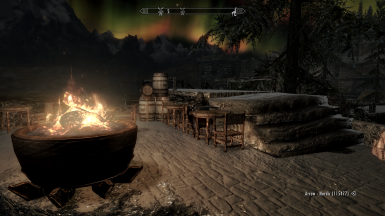 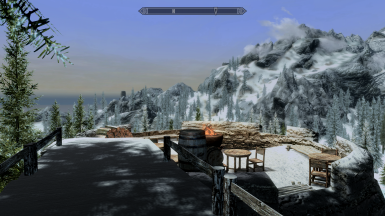 You can now build the Hearthfire house with the Lakeview content installed instead of waiting until after the house has been finished before installing the mod. 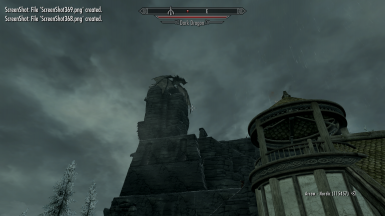 The little “configuration dragon” in the Villa has been replaced by the Business Ledger and Configuration Candle activators in the Guardhouse. 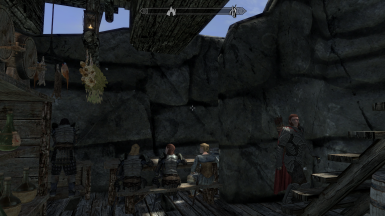 All fighter-guards now sleep in the Guardhouse. 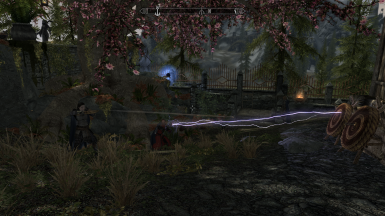 Willow is now an enchanter. 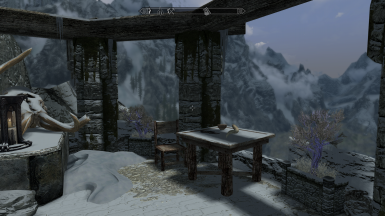 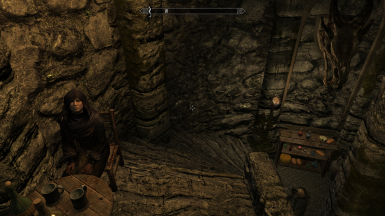 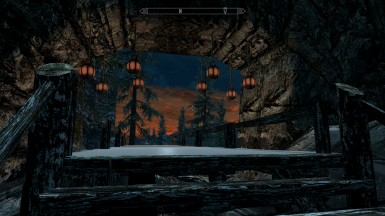 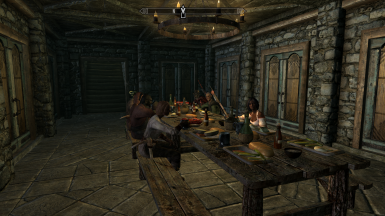 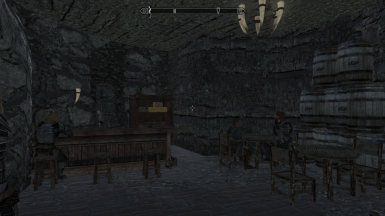 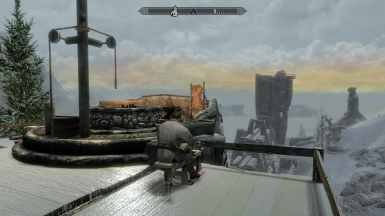 The two mage-guards, the enchanter and the apothecary now sleep in Service Hall in Winterhold College. 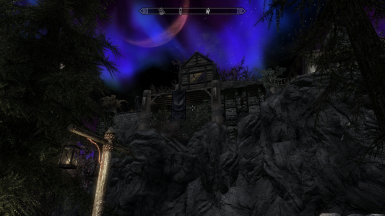 Calista's Incense now houses the magic shop and the door has been re-located to the base of the cliff where the vanilla “evil alter” was located. 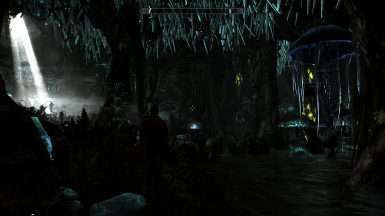 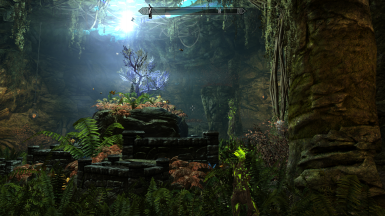 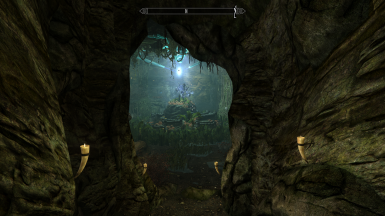 The water in the swimming pools must now be enabled by turning on the dwemer pump located in a hidden room in the Fungal Cave under the sewer grate by the door to Calista's Incense. 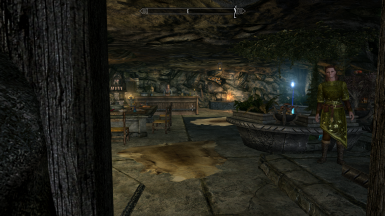 The pull chain by the swimming pools now cycles through 3 functions. 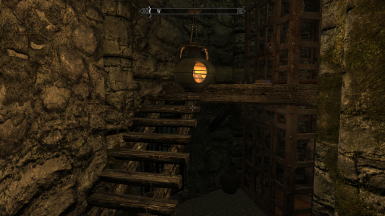 (water spouts on / heat mist on / both features off) The teleportation stones used to access the Prison Tower on the mountain top have been replaced with a long internal staircase located behind a door in the back of the Hortus Sanctum cave. 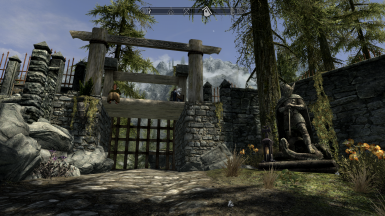 This mod has been carefully designed to work with the Heljarchen Farm, and Windstad Mine mods created by Skvindt.The available HGF patches add these 2 mod's guards to the local HGF uniform mannequin system, their NPC's to a rotating local HGF tavern visiting schedule, their banner displays to the local HGF banner display system, their employees and income containers to the local HGF “worker strike” business system, and their doors/gates to the HGF auto-close system and auto-open for horse rider system. 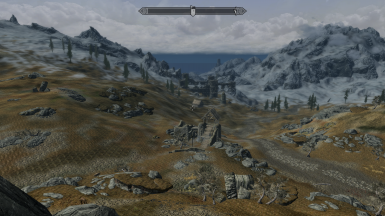 All patches coordinate NPC navigation navmeshes, shared static objects and environmental visual themes for seamless integration. 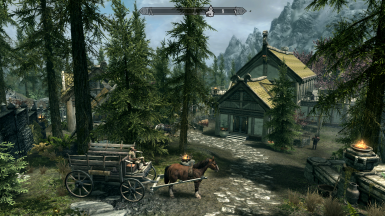 The mine patch also fixes the fast travel horse stable by the wagon so it works properly when the player fast travels to the mine with a horse. 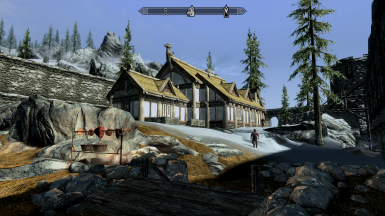 Install/uninstall/update manually or with a mod manager as you would any other mod.